The 2018 NFL season is in the books after the New England Patriots knocked off the Los Angeles Rams in Super Bowl LIII, in the lowest-scoring Super Bowl in history. While the end of the NFL season allows us at Pro Football Focus the ability to look back at the Top 101 players from the past season, it also locks the 2019 NFL Draft order officially in place as the Patriots secured the last pick of the first round with their victory. 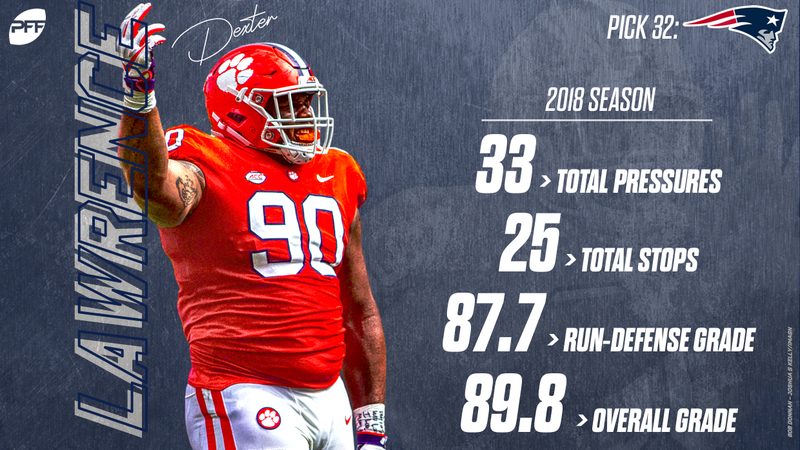 With the draft order finally set, its time to revamp from PFF Senior Analyst Mike Renner’s first mock draft to his second version. In the following mock draft, we will be including trades for the first time this year because, as we saw last year with seven deals on draft day a year ago, it would be silly not to. A friendly reminder from Mike himself: This is what I think teams will do, not what I would do. Passing on the top player in the draft because of ‘scheme fit’ would be absurd. Bosa’s proficiency rushing the passer fits into every scheme in the NFL. He had a higher pass-rushing win rate as a true freshman than a handful of the other edges in this mock had this past season. There’s no shame in drafting defensive line in the first round yet again. He earned the highest grade we’ve ever given to an interior defensive lineman as just a redshirt sophomore this past season. 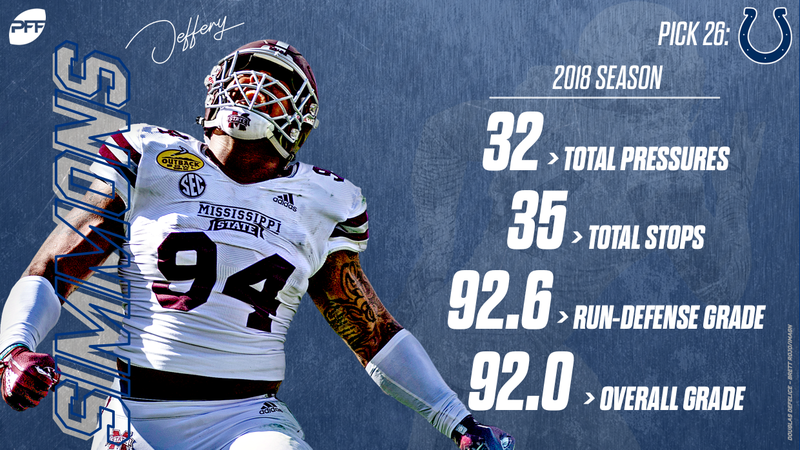 The difference between Williams and the other 49ers first-rounders is that the Alabama product can keep providing that high-level of production from the nose tackle position. John Elway can’t look his fanbase in the eyes if he goes into 2019 with Case Keenum as the quarterback. He also can’t sit back and see where the chips fall with multiple QB-needy teams in front of him. It won’t be cheap, but the Broncos have to make a move. Everyone and their mother knows the Raiders need an edge and Allen led all college edge defenders in overall grade this past season. The offseason prescription for the Bucs calls for defense, defense and more defense. Any position will do. Ferrell has the size and traits teams covet on the edge in the top 10. 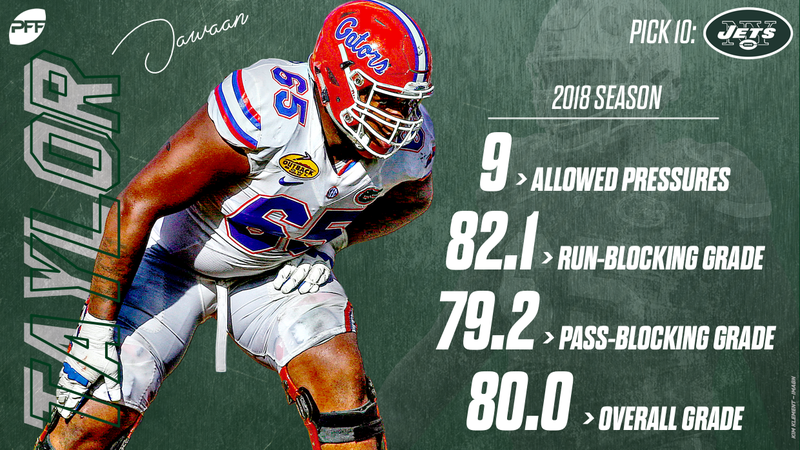 We saw Lock grade out better every single season of his college career and this past season, he led all of college football in big-time throws. Even if Eli is still in the fold, there’s no telling when the Giants will be in a position to draft a quarterback this high again. Metcalf may not have the production, but he has the freakish ability of a true No. 1 receiver and can run the vertical route tree. The Jags haven’t had anyone close to replacing Allen Robinson’s production down the field. Edge is an incredibly glaring need for the Lions at this point. Gary is as explosive a 280-plus pound man as you’ll see in college football. He’s incredibly raw at this point, but so was Ziggy Ansah coming out. With Alex Smith out in 2019 and his career at this point in jeopardy, the future of the Redskins quarterback position has to be addressed. It’s time to think about a rebuild in Washington. The Jets have to add some talent around Sam Darnold. Unfortunately, the value at the skill positions isn’t there early in this draft. Taylor is a freakishly long tackle that can step in and produce right away as a run blocker. Need and value mesh together with White here. The Bengals had arguably the worst LB corps in the NFL in 2018 and White brings a different level of athleticism for them in coverage. Byron Bell was the obvious weak link on the Packers line at right guard last year. Williams can step in and start immediately there while projecting to replace Bryan Bulaga at right tackle down the line. The Ryan Tannehill era is over. That doesn’t mean they have to reach immediately for a quarterback, but I’m guessing they still will. Jones is a tough evaluation, playing with a rough supporting cast at Duke, but his high-end throws down the field will make someone fall in love. He may be undersized and unrefined as a pass-rusher, but you can’t teach the athleticism he brings to the table. Even if Grady Jarrett is re-signed, the Falcons could still use some juice along the defensive line. Murphy has the best zone instincts of any corner in this draft and the Bills are one of the zone-heaviest teams in the NFL. The value at the offensive skill positions would still be a reach at this point for Buffalo. Sweat fits the size/length profile the Panthers seem to prefer from their ends. With Julius Peppers hanging it up, it’s a glaring need. Ford allowed all of eight pressures his first year as a full-time starter and has the size to kick inside and dominate. 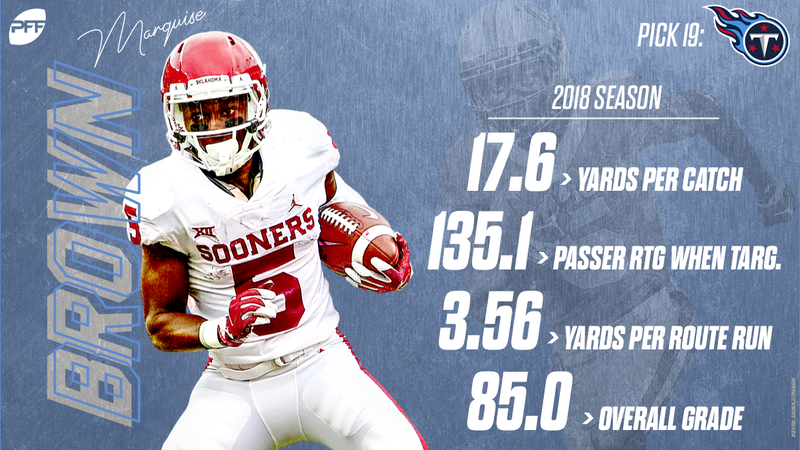 Yet another Oklahoma product as Brown’s speed is a necessity in modern passing offenses. Marcus Mariota had all of 450 deep passing yards last season and Brown’s ability on the deep ball is coveted. With a slight run on corners, the Chiefs trade up to get their man. Williams is NFL ready and profiles best in a press-heavy scheme. The Seahawks were lost trying to replace Cliff Avril’s production this past season. Polite solves that as he’s a speed rusher that will feast on unathletic tackles. With the Ravens expected to go all-in on a Lamar Jackson-led offense, pairing him with a dominant offensive line would be a nightmare. 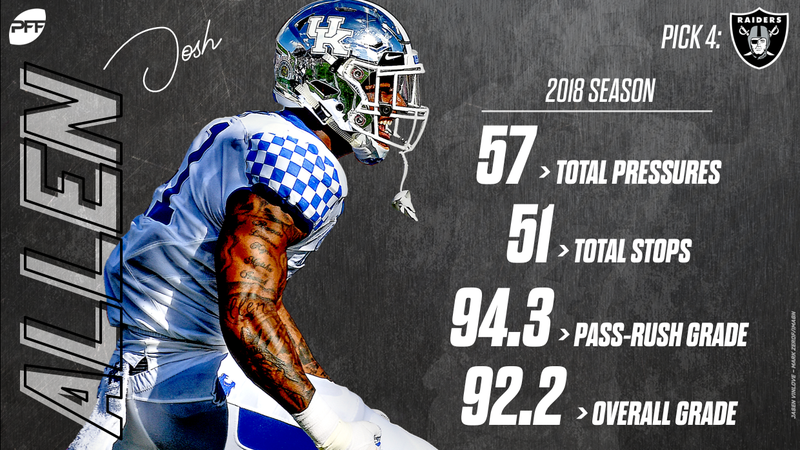 Risner can step into the NFL tomorrow as a run blocker with four straight seasons of exceptional grading. The only way I foresee this pick not being an offensive lineman come April is if they sign multiple in free agency. It’s that big of a need. Dillard had the second-highest pass-blocking grade among starting tackles this past season. 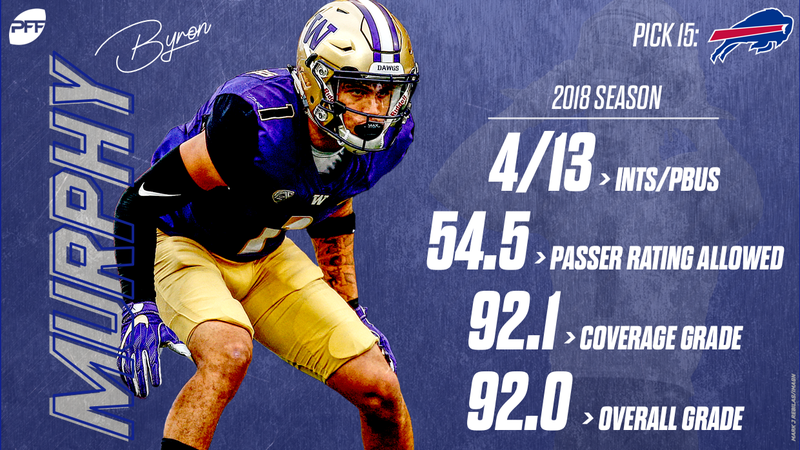 Wilkins had far and away the best season of his career in 2018, but he’ll turn 24 already as a rookie. The Raiders at the moment can use all the NFL-ready talent they can get. Talent-wise, Simmons is a top-10 player in this class. The video of him punching a girl in high school could have teams taking him off their board altogether though. Oruwariye had the best week of any corner at the Senior Bowl earning the highest win rate during the 1-on-1s. He’s an incredibly smooth athlete for being 6-foot-1 with 32-inch arms that likely moved up some boards. After they nabbed their do-it-all safety in the first-round a season ago, they get their center fielder this year. Adderley flashed playmaking ability from the deep middle in his time at Delaware. With Antonio Brown’s future up in the air, receiving weapons are crucial in the Steel City. Hockenson can be that, and a plus-inline run blocker. While edge is a strong need, Mike Pettine loves to get production from his 3-down linemen. Tillery would add another pass-rushing force with versatility. Not too many teams covet a nose tackle highly enough to take them in Round 1. The Pats are likely one that does. Lawrence’s quicks and pocket-pushing ability are rare for a young nose tackle.